Viewing a Guillermo Del Toro film is a remarkable journey into the auteur's subconscious, a wonderfully dark dreamscape filled with elegant predators and fantastic locales. Each of his films is an entity unto themselves, living homages to their creator's childhood memories and to the golden age of film. 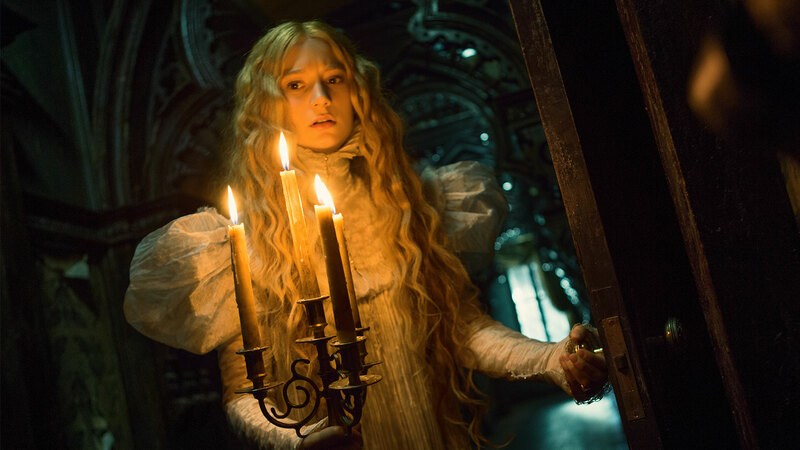 When examining his storied portfolio, his Gothic melodrama Crimson Peak is perhaps his most meticulous effort; a lovingly crafted time capsule filled with awe inspiring costumes and unforgettable set designs that create a world that is both strange and familiar. Aspiring writer with preternatural abilities is wooed by a mysterious foreigner. After the dubious passing of her father, she marries and is taken to her new husband's familial home, a place where the veil between life and death is weakened. Few films have the ability to rip the viewer from their surroundings and drop them into a fully realized nightmare. 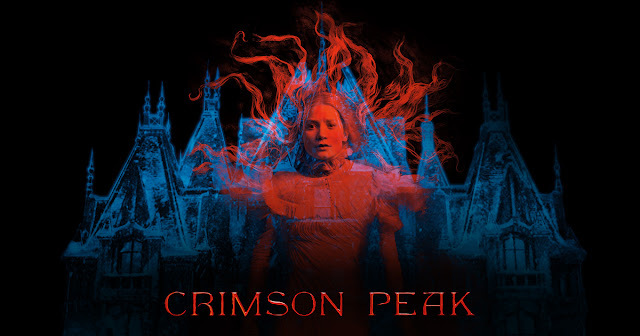 Crimson Peak is an elusive experience, taking the viewer on a gaudy sojourn through classic horror novels and films, featuring campy doomed romance tropes and skin crawling horrors throughout. Part of the fun is surrendering to Del Toro's vision. It's scary, but not too scary. It's cheesy, but just enough to keep the viewer enthralled. The mansion at the center of the action is unbelievable, yet Del Toro's keen attention to detail entices the viewer with its promising menace at every turn. Tom Hiddleston and Jessica Chastain are the center of the this kaleidoscopic whirlwind. Each actor embraces the ridiculousness of the material with scene chewing delivery, particularly Chastain as the film enters the final act. Seeing talented performers abandon any sense of restraint is a pleasure and each of the villains are hilariously rendered amidst the gorgeous backdrops of Del Toro's loving throwback. Chastain's murderous noble revels in her darkness with over the top deliveries and ice-cold exchanges with Mia Wasikowska's heroine. Charlie Hunnam rounds out the cast as the friend hot on the trail of the deceitful duo, and even his small role fits perfectly into the framework. This is a story that has been told a hundred times and upon first viewing, this may disappoint, as the plot's resolution is a foregone conclusion. However, this is also part of the film's charm. Del Toro isn't bringing anything new on purpose, he's simply telling one of his favorite stories in a manner that shows the various possibilities of a genre that has been done to death. Kate Hawley's costume design is a glorious love note to the fashions of the period, dressing each of her subject's in deep reds and virginal whites. Thomas Sanders' production design is the centerpiece, creating a world from history's greatest page turners. 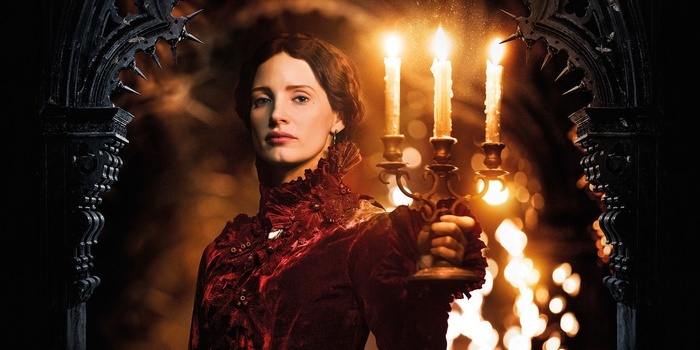 This is a place anyone who’s ever read a book has visited and to experience it coming to life on screen is perhaps Crimson Peak's greatest accomplishment. The mansion is also a character, filled with dangerous corridors and unspeakable chambers. It is an abode no one wants to go to, and yet, the viewer is helpless against their curiosity, wanting to explore every room and every floor, despite the warnings of its occupants. David Marti, Montse Ribe, and Xavi Bastida’s ghoulish make up design is the final component, rendering the undead in a disquieting contrast from the living. Available now for digital streaming, Crimson Peak is an oddity within Del Toro's filmography, requiring several viewings to reveal all of its poisonous Easter eggs. Reactions may vary, but each time a viewer returns to the cursed halls of Del Toro's magnificent ode to monsters and ghosts, his loving adoration for the golden age of horror becomes clearer.